The EBSD-3D sample holder for FEI / Thermo DualBeam FESEM/FIB systems permits FIB milling of the sample and subsequent acquisition of EBSD data. Repeatedly rotating the sample 180 between the milling and the EBSD mapping positions enables collecting 3D EBSD mapping data. 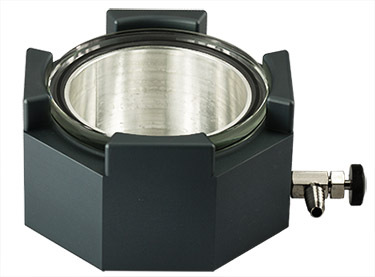 This holder is to be used with the FEI EBS3 software and FEI / Thermo DualBeam systems. The EBSD-3D holder can be used to analyse either the surface or a cross-section of a sample. The angles on the EBSD-3D sample holder are 54° (short facet) and 36° (long facet). 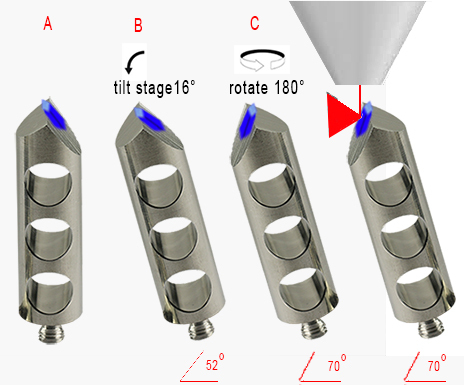 The sample holder is mounted in the centre of the sample stage with M6 fine thread. 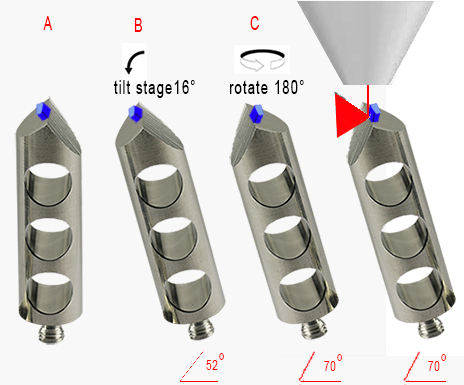 The sample stage should be set at 16° tilt. For analysing cross sections, the sample should be mounted on the short facet, with the 16° pre-tilt this would represent 36° + 16° = 52° tilt; the cross section is now perpendicular to the FIB column. When the EBSD-3D holder is rotated by 180°, the milled sample surface is then at the 70° angle (54° + 16°) for EBSD data collection. For analysing larger surfaces, the sample should be mounted on the long facet, with the 16 pre-tilt this would represent 36° + 16° = 52° ; the sample surface is now perpendicular to the FIB column. When the EBSD-3D holder is rotated by 180°, the milled sample surface is at the 70° angle (54° + 16°) for EBSD data collection. Made from vacuum grade aluminium. Produced in cooperation with FEI EBS3 users.